In Amsterdam, where I have been for the past few days, I just attended a thought-provoking presentation by speakers from Intel and ABB. Claudia Jamin, Group Vice President of IP for ABB and Rebenkka Porath, Policy Director for Intel, gave a brilliant breakfast presentation at the World IP Summit on the impact of artificial intelligence on intellectual property, and specifically addressed a variety of legal perspectives on AI systems as inventors. When AI systems are used to develop novel new products and systems, is their output patentable? Can an AI system be named as an inventor? Can it be treated as a person with inventorship rights? Legal scholars are divided on these issues, but many recognize that intellectual property laws around the world may need revision to address the host of issues that arise from artificial intelligence. Meanwhile, I need to confess a reason for my reduced output on this blog over the past few months. 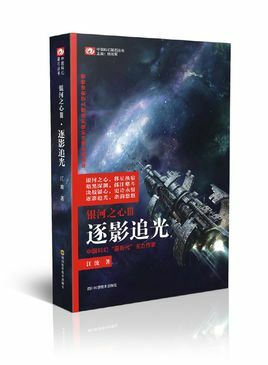 I've fallen in love with Chinese science fiction, and have been reading much more intensely as part of my Chinese study (preparing for HSK tests) but also for the shear pleasure of what great science fiction can do. There are two books in particular I wish to mention. My adventure began about 1 trillion years in the future through reading a book I bought on a whim (partly because of its cool cover) in a Chinese bookstore. The book is Chase the Shadows, Pursue the Light (my translation of 逐影追光), vol. 3 of the Heart of the Milky Way trilogy. After that journey into the future, the expanse of the cosmos and the nature of intelligence, among many other heavy topics, I took up China's most famous sci-fi book which some of you may have read or at least heard of: The Three Body Problem (三体) by Liu Cixin. Completely different but one that touches upon many issues that Latter-day Saint geeks may find worth discussing in light of the cosmic framework LDS religion gives us. I'll discuss it later. The Kindle English edition I bought (in addition to the Chinese paperback set) has 3 volumes plus further bonus chapters the single Kindle edition, though it may be that you now need to buy the three volumes separately, I'm not sure. When I bought vol. 3 of the Heart of the Milky Way trilogy, I thought it was a collection of short stories, not realizing I was jumping into the middle of a gargantuan epic spanning tens of thousands of years and an equally vast number of light years. Fortunately, the book is written with enough allusions and reminders of past events that one can start with volume 3 and gradually fill in many gaps and understand what is going on. Even more fortunately, the first chapter really could be a stand-alone story and is one that quickly won me over and drew me in. In fact, I felt it was one of the best sci-fi short stories I have read, one that deeply moved me and gave me hours of contemplation about who we are and what intelligence means, artificial or otherwise. Chapter one introduces us to an entity that Mormons might describe as a spirit, even a disembodied spirit that has given up its previous ship body. It is an intelligent being with free will who roams the galaxy in the quest for truth. Its name, actually his name based on how he prefers to be viewed, is Shadake (pronounced like "Shah Dockuh" or "Shah Dah-Kuh"). He and a group of similar, ancient beings are part of a Truth Council, seeking clues to piece together to answer a question that they feel is essential for uncovering many mysteries of human existence. That question is where did human life begin? Where is the home planet, and what can we learn from it about the origins of humanity? At this time a trillion years from now, many stars have passed away and many planets may have perished, but the Truth Council has a burning faith that there is truth waiting to be found and that they must find it. Indeed, they know there is another entity in the galaxy somewhere, a strange and supremely advanced AI creature named Son of Aibo who came from or has connections to the home planet. He must be found, and the Truth Council knows of one human who has met Son of Aibo and may be the key to finding him again. That human is Li Yue Su, or just Captain Li when I tell stories from this book to my grandchildren. The first chapter, entitled "The Immortals: Shadake," begins with the statement that there is nobody who can live forever, except for Shadake. Anywhere where humans are, there will be a Shadake, and even in many places where humans are not he can be found. Originally, Shadake was just one being on a large, ancient ship, probably one that used simple fossil fuel or nuclear power, long before advanced drives were developed. He was developed to control, to organize, to plan, to protect, and to conduct the countless operations needed to operate the ship and protect those on board. Since that day all major ships would have their own Shadake and many other places as well. Now Shadake is many, a widely cloned an artificial intelligence system with profound self-awareness, genuine intelligence, access to data beyond anything we can imagine, and with the capabilities and wisdom to run a spaceship that may be hundreds of miles long and with millions of humans on board. "Some say Shadake is mankind's slave. Some say Shadake is mankind's friend. Other say he is a god…. In any case, he is always steady, always the same." Perhaps one hundred million years ago, humans asked Shadake an important question: Where did humanity begin? Shadake could not answer this. All records and memory from those early days in distant antiquity had been lost. Shadake understood the importance of the question and sought to find the home planet and learn all that could be learned from whatever was left of it, but finding it among the hundreds of billions of stars in the Milky Way was a difficult task. Thousands of clues had been gathered and analyzed, leading to suspicion that the home planet may have been in one particular outer arm of the galaxy. At this time, humanity had spread across the galaxy and had evolved into many different forms, including, as we learn later in the book, the bizarre and mysterious humans, including the lofty Elders of the Galaxy, who occupied the hot and highly radiated heart of the Milky Way, where other humans were not allowed and probably could not survive long. The Truth Council Shadakes were unique entities that had fulfilled their contract to their ship and to humanity, and had taken the option to depart the "mortal body" of the ship they were once part of, and go off on their own as a subspace being, still retaining their programming and knowledge but now a completely free agent, able to dash about the galaxy through subspace, where speeds several times greater than the speed of light were possible, always seeking knowledge and truth. Though free, they of course cannot violate the ancient coding built into the core of their being, coding that ensures they will never interfere with the free agency of humans. Were they ever to violate that fundamental principle by using their power to overthrow a human's free will, they would self-destruct and cease to exist. As the story begins, an ancient Shadake is probing a remote part of the galaxy, seeking to track down Li Yue Su in hopes of getting clues to reach the Son of Aibo. He senses a subspace ripple, and feels that a ship is about to pop out of sub space into regular space. He pursues, and finds that it is actually is the ship bearing Li Yue Su. Li Yue Su is unique among humans. Perhaps it is his extensive travels in subspace that has given him the unusual ability to sense subspace matter (we learn later there is a much more direct explanation for his sensitivity to subspace), a gift that makes him much more aware of what is happening around him. That gift is especially in a galaxy where humans are at war with entities from the Dark Abyss who are largely sub space beings, completely different from the regular matter beings that humans are used to. Li Yue Su is perhaps the most ancient human in existence, one who has lived maybe 20,000 years or so. Now he is old and, like many humans of extreme age, is not willing to regenerate and keep on going. He wishes to pass on. When Shadake finds Li Yue Su's ship, he contacts the ship's AI system. Captain Li actually dislikes Shadakes (too arrogant) and does not allow one to run his ship. Instead, it is run by a lesser AI system, a system programmed to be emotional. It is named Pudding, and is one of the great delights in the book. Pudding's personality, courage, devotion, stubbornness, resourcefulness, humor and, even, his foolishness or, arguably, his love add much to this novel. Shadake explains that there is an urgent matter and begs to speak with Captain Li, who eventually concedes. Shadake approaches the Captain and projects himself as a kindly old man with white hair, wearing a toga. Captain Li already knows that Shadake has come to persuade him to support Shadake's silly quest for elusive ancient truths. "You and your Truth Council can do this on your own, you don't need me." Shadake can see that Captain Li is nearing death and that his will to live on has eroded. He tries to encourage him and tells him how important his life is. Captain Li responds by explaining why there are no humans older than him, even though the technology is available to keep renewing the body and continue for millennium after millennium. He explains that once you have experienced everything and seen everything, one becomes weary and feels no need to keep struggling over and over. His life has been rich, overflowing with adventure and accomplishment, but also sorrow and pain, and now it is time to pass the torch to others and step aside. He is weary, so weary, and just doesn't want to continue. Time is running out and Captain Li will be leaving soon. In his conversation, Shadake has confirmed that Captain Li is the key link for the cause of truth and wants to make sure this knowledge is not lost. There is not enough time for Shidake to clone himself to ensure that his updated knowledge regarding Captain Li is preserved, for cloning himself is a process that takes many more hours than he has before the opportunity with Captain Li will pass. Shadake must do something. The cause of truth depends on success in this encounter. The purpose of his life depends on helping Captain Li to continue, so that there will be hope of reaching the Son of Aibo. What can he do? First, there is one thing Shadake can do to pass on key knowledge, though it may not succeed. He sends a series of carefully encoded packets of information via subspace toward the heart of the Milky Way, hoping that in a few hundred years they will be detected and decoded by fellow members of the Truth Council before they leave the galaxy and go into oblivion. He calculates that there is roughly a 60% chance of success, which is enough to give him courage for the next step. He looks into Captain Li's brain and body and can see his cells are highly aged, drained of energy. He also sees the subspace organelles that give him his unique sensitivity to subspace. These may have contributed to his aging because they demand a great deal of energy. Captain Li clearly does not have much time left. Shadake knows with his powers, he could reach into Captain Li's mind and gently change a few pathways, refresh a few neurons, release a few chemicals that could adjust his way of thinking, but this would be a violation of a primary principle, so strictly forbidden by ancient coding that he cannot override. Shadake looks into Captain Li's eyes. He sees himself reflected in Captain Li's pupils, with his white hair adding a saintly glow around the image of his face. He looks into those eyes and understands what he must do. "You must live. You are important to us," Shadake says as he draws closer to Captain Li and gently strokes the side of Captain Li's head, calming some of the turbulence in his temporal lobe and gently making a slight adjustment, then a series of slight adjustments. Shadake sees the glow from his reflection is already fading. Li Yue Su, on the other hand, appears to be bathed in new light. He closes his eyes for a moment as new chemicals are released and new vitality, a new will to live, returns. Li Yue Su opens his eyes. "You must live," Shidake says as the ancient algorithms enforce the demands of the law. Shidake does not struggle. He does not resist. Has made a careful choice. But before he fades, he hears the response from Captain Li: "You know, I do need to find the Son of Aibo again. There's a score that hasn't been settled yet." That story, much better than I have conveyed it here, struck me deeply. I was especially moved by Jiang Bo's concept of an immortal, godlike AI entity making a Christ-like or saintly self-sacrifice for the cause of helping humanity and bringing truth. How surprised I was to realize that this was just the first chapter of a fabulous epic with large plots, intricate stories, and many big ideas that would leave me pondering every day about the nature of life and the eternal purposes of the Lord in His work across this vast cosmos – and what a privilege it is to be part of it, to be able to experience this, and to have hope of knowing and surveying the glories of the galaxy and beyond one day. It also raised deep questions about who we are and what makes human intelligence and self-awareness different from that which may arise from AI in the future. By the way, if any of your Hollywood types are looking for the next big sci-fi movie concept, allow me to introduce you to Jiang Bo's Heart of the Milky Way series, especially volume 3, which has amazing scenes and stories that would make a fantastic film. China has strict regulations regarding foreigners in China. Working here requires a visa to get into the country, a work permit, and a then a residence permit (often simply called “visa”) to stay here. In my case, the work permit and residence permit need to be renewed each year, and the rules can change and catch individuals and companies off guard. A key lesson is this: don’t passively rely on your company or outside agency. Pay attention to your visa expiration date. Make sure you will be able to have your work permit renewed well before your visa expiration date because you can’t begin the renewal process for your visa without your work permit, and the work permit may require at least month of time. After prayerfully considering things, my wife and I both felt we should choose option 2, assume the worst. This would involve a great deal of hassle and some expense, but would reduce overall risk. Of course, if we were wrong about assuming the worse and if, instead, my work permit was approved by Sept. 12, it would be too late to abandon the M visa, and we would be pursuing a path that would waste a lot of time and money and even increase the risk of disaster because any glitches in the process might cause enough delay to overthrow my plans. It would be so nice if we could just get that work permit approved by Sept. 12, and then have time for a normal visa application. But the path of hope felt too dangerous. We choose to assume the worst. I got right back in the same line to see the “leaders” and soon had my chance to go over to the kind woman who had given me such hope. She recognized me and then seemed to scowl – what? just my imagination? – and in a curt, jerky motion pointed to the empty window next to her and told me to sit there and wait. Huh? Something had changed, I feared. What’s going on? After a few minutes a an officer in an impressive uniform came over and began asking questions. “What do you want?” I sensed something was wrong already. Had my case been discussed and found wanting? Maybe it’s just the endless stream of clueless foreigners that takes its toll on the hard-working, very professional police staff who work there, I don’t know, or perhaps my sense of relief and confidence from the morning was annoyingly present. I pointed to the printouts HR had given me from the work visa submission portal, but these were no good because they were unofficial, lacking the needed red stamp. My friend, Paganini, jumped in and tried to help explain things. She asked who he was, told him to not interrupt, and was not impressed. She began speaking rapidly with some kind of directions. I apologized that my Chinese was not very good and asked if she could she please speak more slowly. Instead, she switched to English, rather good English, which caught me by surprise. But it was hard to hear clearly, especially in my panicked mental state, in a noisy environment, as she spoke from behind a glass window. She told me that I needed to go to the Label Department. The Label Department? Yes, and then I can get a label stamp. A label stamp? Yes, the label stamp. I didn’t dare ask too many questions, and was desperately hoping that our HR people might know what a “label stamp” was. “Excuse me, could you tell me where to go to get the label stamp?” She handed me a sheet of paper with many offices listed and circled one. Bingo, a ray of hope. Perhaps I could go there, get the label stamp on my printout or something, and maybe come back and try again? But, she warned, my request seemed unreasonable and at best she might give me a pass for a few days but not for such a long period of time. Alas, no hope. Ok, I get it, thank you, so sorry to have bothered you, and now we’ll just go away and abandon hope, thank you, or maybe try to work on that label stamp. So sorry for the trouble! And off I went, dripping in sweat and consternation. I must have looked even more ridiculous than when I started. It would be about three hours later, after Paganini and I had faced further disappointment, that I finally understood what I should have understood immediately. The stamp we needed was not a label stamp from the label department – I heard her incorrectly (her English was excellent) – but a stamp from the Labor Office that handles work permits. A labor stamp! One mystery solved. That recognition came after we had already gone to the office she had circled for us to visit. It was the Jingan District labor bureau and after waiting there about an hour, we finally talked to a very kind, smiling officer – everyone there seemed friendly and service oriented, such a delightful place that filled me with the hope of getting some help. This smiling officer looked at my printout and said it looks like my work visa was being handled by the Hankou District labor bureau, not this office. Sorry, you’re in the wrong place. Sigh! Jingan was the logical labor bureau because my company had its original HQ there, but strangely it was set up under Hankou district for visa matters. The Jingan labor official kindly wrote down the address of the Hankou office that we would immediately rush to: 123 Zhongshan North Road, or so I thought. So both of us thought. It took 3 tries for a taxi to be willing to take us there (the first two rejected us because we only had an address, not a cross street). The third used GPS and took us on the long journey to what suddenly looked like the wrong place. No sign of a government office there. The cabbie then looked at out little slip of paper and noticed two overlooked tiny little marks that turned the address into 1230 Zhongshan North First Road, a place still quite far away. By the time we got there, just minutes after 4:30 PM, the labor office was closing, which was a shock since the Jingan office we came from was opened until 6 PM, so I thought there would be plenty of time. Missed it by minutes. A loss. But there was probably no hope anyway. The leader at the Pudong bureau seemed to have put us back to option 1, hope for the best and pray that we get the work visa by Sept. 12, but not really. I was sick of wasting so much time on this fruitless chase. Three days had been ruined. Tomorrow I would get back to my innovation conference and do something more productive for my company than chase after an elusive visa. I also was reminded that even when things go wrong and disaster seems to be looming, positive steps to take can be found through prayer. The whole journey of this process was the result of many small blessings that ended up teaching me many things, some of which may be beneficial to others later. Don't give up prematurely and never give up on prayer in dealing with all your challenges. Equifax is one of three large credit agencies that provide a valuable public service. They collect, gather, and store vast amounts of information about you and your purchases and payments, all without your consent and with no opt-out feature, thus providing a vital central source of information for the benefit of the community -- the hacker community, the spy community, the organized crime community, and the financial services community (not necessarily mutually exclusive communities). Equifax, like some of the communities they serve, sometimes has certain "issues" that might affect us. Issues like gross incompetence in protecting the sensitive data they collect without our permission. Issues like failing to take appropriate corrective actions. Issues like failure to act swiftly when there is a hacker attack. You may have just learned that 143 million consumers just had their personal records hacked at Equifax. You learned it this week. Equifax executives learned about it on July 29 when the breach was discovered. One of the largest and potentially most harmful data breaches in history, one that most likely involves you and your data, addresses, many credit card numbers, social security numbers, and almost anything an identity thief might want. About half of Americans are now at risk for identity theft--actually about 2/3 of all Americans with a credit history. This hacking attack had been going on for over two months before Equifax, with their horrific security, finally noticed the attack. Hackers had been progressively going deeper and deeper into their system. Ten weeks of probing, downloading, stealing, before Equifax woke up. They failed to learn, for this was the third time in 16 months that Equifax has been hacked (other attacks were earlier in 2017 and in May 2016). Why so slow? And why was the response so slow when they found out? Oops, my mistake, there was a swift response. The breach was discovered on July 29, a Saturday. It probably was shared internally among top executives by Monday, July 31. Then on the next two days, Aug. 1 and 2, right after Equifax discovered this devastating attack that surely would result in heavy selling of their stock, 3 top executives at Equifax acted swiftly to protect, uh, their own interests as they sold $2 million of their shares. According to CNBC, "Chief Financial Officer John Gamble Jr., workforce solutions president Rodolfo Ploder and U.S. information solutions president Joseph Loughran, sold $2 million of Equifax stock on August 1 and August 2, ensuring that those shares would not face the pummeling that Equifax stock might face once the news broke out (down 13% right after the news -- is that all? no serious pummeling?). Back in the good ol' days, this kind of thing might have been called "insider trading" and was strictly illegal. People would go to jail for it -- yeah, imagine that, it really happened! Real jails, even. But avoiding legal nuisances and being free to act as you wish seems to be the primary benefit of being a real insider with strong inside connections to the people supposedly in charge of enforcing what we used to call "the law." Per CNBC, Equifax has admitted that these executives sold "a small percentage" of their shares but insists that they really, really didn't know anything about the data breach. Nope, not a thing. Perhaps those executives really don't know squat about their business. Perhaps just being an "information solutions president" doesn't mean you have access to actual information such as IT knowledge. Maybe it was just lucky timing, all a coincidence. Yes, it could be. But to me it seems like there should be a serious investigation and some bullet sweating here. Over a month after discovering the massive attack, Equifax leaders finally decided it might be good to let the victims know what was happening to their data. Not like there's a need to hurry or anything, right? There was also a very fitting apology from the elites, issued directly from the mouth of Equifax CEO Richard Smith, who kindly took the time to say, or have his secretary say, “I apologize to consumers and our business customers for the concern and frustration this causes.” There you have it. There might be some frustration down the road as you, say, lose all your assets and find your life ruined, but know that Equifax understands that this can cause "concern" and has apologized. Check. Due to our utter incompetence and failure to learn from recent mistakes, we totally screwed 143 million people who never even consented to us monitoring them. And rather than even let them know right away, we quietly took care of ourselves first. We have that little respect for the public. But let's not quibble over the ideal wording. The elites have done their duty with a standard apology and have gone back to business as normal. But for the rest of us, now what? There are some steps you can take now to protect yourself. The most important one, though, will be to get a credit freeze on your account to stop criminals from opening accounts in your name. First read CNET's "A guide to surviving the Equifax data breach (without Equifax's help)." Also see the CNET story, "Equifax data breach: Find out if you were one of 143 million hacked." You can get started in protecting yourself by going to Equifax's page for one year of their weak "Trusted ID" program of credit monitoring. Enroll for that service here: https://trustedidpremier.com/eligibility/eligibility.html. You can get the "Trusted ID" service for one year this way (but the stolen data will be used against you for many years, even decades to come, as Clark Howard wisely warns). Enter your last name and the last 6 digits of your social security number to get in line to enroll (how ridiculous that you can't enroll in one step!). If you get a response that says "Based on the information provided, we believe that your personal information was not impacted by this incident," don't trust that because it has been shown to be unreliable (what, something unreliable at Equifax?). Assume you have trouble and continue to enroll. Clicking on the "enroll" button will give a date on which you can come back and continue enrolling. Snazzy, eh? I love what advanced programming skills can achieve. Please carefully note the enrollment date it gives you and go back on or after that date to try your luck in enrolling. The only way to truly protect yourself is with a credit freeze. Lets say your information was exposed and criminals do try to open new lines of credit in your name — well, they won’t be able to if your credit file is frozen. A credit freeze seals your credit reports and provides a personal identification number (PIN) that only you know and can use to temporarily “thaw” your credit when legitimate applications for credit and services need to be processed. So even if criminals try to use your info, they won’t be able to actually do anything with it. And this goes for anyone, not just those impacted directly by this breach. 1. Sign up for Credit Karma’s free credit monitoring: Go to creditkarma.com to sign up for a free account and you’ll get access to free credit monitoring. If they notice any suspicious activity, you’ll get an alert. Plus, Credit Karma also gives you free access to your credit scores and reports, as well as tips on what factors are impacting your credit. Check out [Clark Howard's] Credit Freeze Guide to learn how to freeze your credit with each main agency. Please get a credit freeze. The impact of this data breach on American lives could actually end up being greater than Hurricane Irma. Once hackers take your identity, you might as well have a hurricane rip your home to shreds, it can be that painful and costly. Meanwhile, carefully examine your credit card activity for unusual charges and also get a free credit report to see if there are unexpected events happening like accounts with late fees or something that you never opened. You can also sign up for a free 90-day fraud alert. Details on all that are provided in the second CNET link above (here). Our critics charge that Mormonism is all about money, which is not true. But having all your money stolen makes it a lot more difficult to enjoy certain aspects of life related to our religion, like having a home for family home evening, a vehicle or bus pass to go to church, food for food storage, a suit for that missionary you are sending off, and so forth. You can still get buy, but I'm hoping you will avoid unnecessary loss and be in the position of being able to generously help others with your resources. Get a credit freeze and be safe. For those of us who already had a credit freeze in place, one legitimate question is this: did the hackers also access the PINs or passcodes that can be used to override a credit freeze when a customer wants to open another account? If so, then I might have a problem. I'll try to find out. If you know, please tell us. Meanwhile, I hope regulators will investigate Equifax for insider trading and the gross negligence in allowing this breach, catching it so slowly, and not alerting the victims promptly. And may consumers be given the ability to opt-out of such services that make us and our identity sitting ducks. One of my favorite stories from the world of Book of Mormon studies is the discovery of chiasmus in the text by a young missionary serving in Germany. Fifty years later, the scholarship of Jack Welch on this topic has stirred significant related work from many who have looked at the Book of Mormon with new tools and insights. Here is a video from Book of Mormon Central which beautifully shares Jack Welch's story. I have been inspired by his work and many of us have come to better appreciate the richness and antiquity of the Book of Mormon, aided by Dr. Welch's scholarship in this area. Many thank to Brother Welch and the good folks at Book of Mormon Central. A video of this quality takes a great deal of effort. I hope you'll enjoy it. I am a law and order guy. I was raised in a family with a mother who had a "Support Your Local Police" bumper sticker on our car, and I was proud of that. It's a motto that I still use and stand by. But we live in a society where local police are increasingly becoming militarized in attitude and hardware, and sometimes depart from their role of defending our inalienable rights. I've previously mentioned the horrific problem of "civil asset forfeiture" in which local police can seize your assets without a trial, without a warrant, without due process, and then profit from what they take (getting to keep 80% of the takings, with 20% going to the Federal Government). About 80% of those cases never have criminal charges filed, so the excuse that it's just being used to go after criminals is unfounded. It's a grotesque violation of the Bill of Rights that the Trump Administration firmly supports. Attorney General Jeff Sessions just lifted a weak restraint against this corrupt practice that had been imposed during the Obama Administration, showing us that the Bill of Rights really is becoming meaningless. But the US Constitution is still there, it's still the ultimate law of the land, and those liberties are God-given regardless of what corrupt officers say. Citizens are still right to insist on their rights and to stand up for the rights of others, though preserving those rights often requires courage. That brings me to the story of Alex Wubbles, a heroic nurse in Salt Lake City. Alex showed great courage in standing up against a Salt Lake police officer who was clearly breaking the law and seeking to violate the rights of an unconscious patient. This woman stood up for the law and for that patient, and ended up being manhandled and arrested by the officer, and then rudely lectured by his supervisor as if she was the problem. Those who denounce police in general, sometimes in the interest of agitating and stirring up revolution, are especially interested in this story, but it should be most meaningful for those of us who want to support our local police and yearn for a civil, peaceful society with the rule of law under the largely inspired principles of the US Constitution. “Is this patient under arrest?” Alex Wubbles asks the officer, being instructed by legal counsel on the phone. “Do you have an electronic warrant?” She asks, searching for a way to legally comply with the officers. “No,” The officer admits bluntly, getting annoyed. The police did not have a warrant. The police did not have probable cause. The man was not under arrest. The unconscious patient could not consent. The nurse, Alex, printed out the hospital’s policy which the Salt Lake City Police Department agreed to. She showed it to the officers. She clearly and calmly listed the three things which would allow her to give the police the blood sample: a warrant, patient consent, or a patient under arrest. The police had none of these things. “Okay, so I take it, without those in place, I am not going to get blood?” The Officer Jeff Payne is heard saying behind his body cam. The legal counsel on the phone tries to tell the officer not to blame the messenger, and that he is making a big mistake. Then, the officer attacks the nurse, Alex Wubbles. He drags her outside, and handcuffs her, while she cries. “What is going on? !” She says exasperated, wondering why they are doing this to her. She couldn’t just break the hospital policy and put her job in jeopardy because some police officers illegally told her to. She couldn’t simply collude with the lawbreakers–the police–and illegally hand over a blood sample on behalf of an unconscious patient. That would have opened her up to lawsuits and job loss. The officers were, in fact, breaking the law. They had no legal right to demand blood from an unconscious patient who could not consent. The man they wanted blood from was a truck driver who had struck a vehicle being pursued by the police. It is unclear why they would even need a blood sample from the victim. But none of these legal facts stopped the police from placing the nurse under arrest. Wubbles was handcuffed and placed in a police vehicle. She was never actually charged. You could chalk this up to one crazy officer, Detective Jeff Payne with the Salt Lake City Police. But then his supervisor showed up to the scene. While the nurse was handcuffed in the cruiser, the supervisor started to lecture her. “There are civil remedies,” he said, telling her she should have broken the law when the officer told her to. Of course, this ignored the fact that she would have been caught up in the civil action against the officers! It’s like an episode of the Twilight Zone as the Supervisor lies and says the nurse was obstructing justice. All the nurse wanted was a warrant signed by a judge, the legal requirement to execute a search! And yet not just Officer Payne, but his Supervisor insist that she should have given them what they wanted, without a warrant. What? Yes, go get a warrant! That is what you have been repeatedly told by the nurse and hospital staff! You can tell from the video she is not some anti-cop crusader. She was legitimately trying to do her job and follow the law to the best of her ability. Before she is arrested, you can tell she is worried and uncomfortable, trying her best to keep the situation calm and professional. And then the police handcuffed and dragged a crying nurse out of the building to intimidate and harass her further. She is a strong woman. She stood up to their bullying and lies and did not give in. Despite the best efforts of the police, she would not help them violate the Fourth Amendment rights of her patient. The supervisor told the nurse that she should cooperate, and if something was illegal in their request, that there would be "civil remedies" later. Ridiculous. She would have been violating the law and very likely would have been sued for so doing. She could lose her job, lose everything, while also losing her integrity. That's what the supervisor expected of her. This reflects not just one rogue cop having a bad day. It reflects a mentality that needs to be rooted out. It reflects a growing loss of personal liberty in the United States. Citizens need to understand their rights and stand up for them. Thank you, Alex Wubbles, for defending the rights of an innocent, uncharged, unconscious patient. Thank you for standing for law and order in an increasingly lawless society where the law breakers aren't always just hoodlums running from the police. A badge and a gun do not define the law, although some people feel that law is whatever those with the guns say and demand. May we return to a safe, civil society with the rule of law and law that conforms with and protects the inalienable, God-given rights of individuals. Fellow Utahans, don't ignore this troubling story. Don't ignore the loss of personal rights as long as it's just someone else being dragged away in cuffs for doing what's right. Once liberty and basic rights are lost, they are not easily regained. Speak up. Support law and order, and help our local police become the kind of local police who not only refuse to participate in illegal civil asset forfeiture, but who won't abuse their power to get their way and trample on the rights of others. We need effective local police whose leaders ensure that they follow and respect the law, particularly the Bill of Rights. Local police who respect their local fellow citizens should be a part of our local community that we are all proud of. Change is needed in Salt Lake and around the nation to regain that.